It seems to be a good day for those interested in Galaxy Note 9 rumors. We just saw some credible information telling us the Note 9 could have a 4,000 mAh battery, and we are now getting details on the color options that might accompany the Galaxy Note 9. 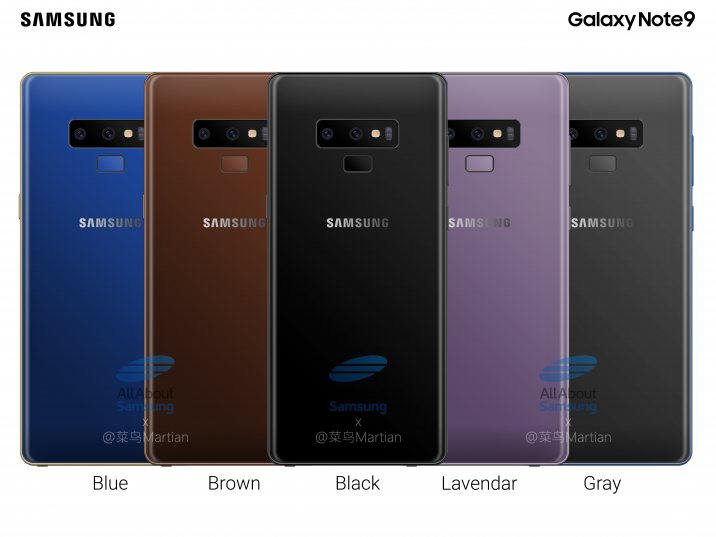 According to AllAboutSamsung, the Galaxy Note 9 could launch in blue, brown, black, lavender, and gray; the website has also put up a few concept images showing off what those colors might look like. We reached out to our own sources, and we can confirm that at least purple, black, and blue are going to be included in the color palette. AllAboutSamsung says that Samsung is making minor adjustments to some of the colors compared to how they were seen on existing devices. 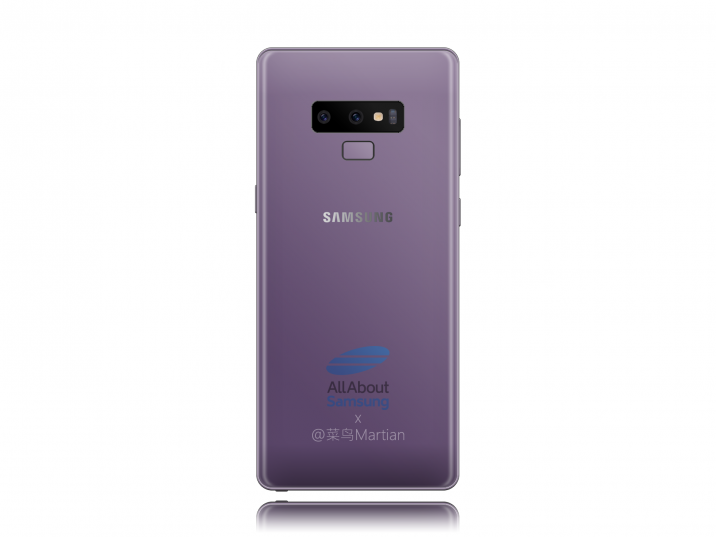 Purple, for example, is now supposed to be somewhat lighter than the Lilac Purple shade on the Galaxy S9 – perhaps like the Lavender option Samsung introduced for the Galaxy A6? The gray version is apparently a bit darker than the Titanium Gray Galaxy S9, with a slightly bluish metal frame. 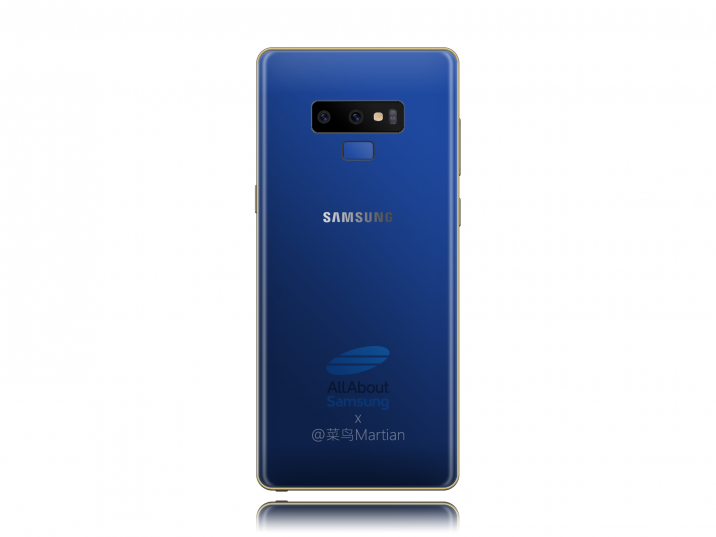 The blue version will reportedly have a golden frame, and its shade will fall somewhere between the blue Galaxy Note 7 and Galaxy Note 8. The black Note 9, meanwhile, is said to be the same as we’ve seen on the Galaxy S8, Galaxy S9, and Galaxy Note 8. As for brown, it’s a color that the Galaxy Note II was launched in all those years ago. More recently, Samsung made a brown Galaxy S6 exclusively for the UK, and it looks like the company is bringing it back for the Galaxy Note 9. The brown and gray options, if they do exist, are likely to be limited to some markets, just like the Titanium Gray Galaxy S9 has been. However, Samsung marked a new trend this year by launching the Galaxy S9 and Galaxy S9+ in three colors in almost every market on day one, so we could see the company raise that number to four for the Galaxy Note 9. What do you think? Would you be interested in a brown Galaxy Note 9? There never was a Brown S6 (edge) in the UK or anywhere for that matter, it was just a bug on the website.